Posted on May 5, 2015 at 12:42 pm. It’s that time of the year again where Royal Vegas Casino gives loyal players the chance to take part in one of the longest running and most talked about promotions in the online gambling industry. The Fortune Lounge Cruise has been happening annually since 2006, a promotion run by all members of the highly reputable Fortune Lounge Group which includes Royal Vegas Casino, 7Sultans and Platinum Play. 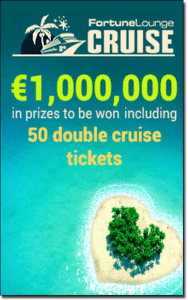 This highly sought after promotion gives players the chance to win a ticket for two on a luxury cruise along with 50 other lucky winners and their guests who will all be pampered by the VIP team for a week of pure indulgence and fun. During the cruise different events are hosted daily, with on board pokies tournaments hosted by the VIP team giving players the chance to win thousands of dollars in prize money during the trip. The promotion is currently underway and is running until July 31st 2015. To be eligible you’ll need to register for a real money account with Royal Vegas Casino, with new players able to take advantage of up to $1,200 in welcome bonuses. Once registered, keep an eye on your emails and for notifications within the casino lobby for details on how to enter as there are different ways to win each week. Daily prizes are up for grabs including casino credits, free spins, cash back and real world prizes like designer luggage, spa vouchers, all expenses paid dinners and lots more. To secure your place in the draw for the cruise tickets simply play your favourite pokies game at Royal Vegas Casino for real money wagers in order to earn as many reward points as possible. For every 200 points you accumulate you’ll receive one entry into the cruise draw. All up there’s $1,000,000 in cash and prizes up for grabs, so head to Royal Vegas Casino today to ensure you’re in it to win it.